Deadpool Annual #1 comes out tomorrow May 4, 2011. This is the second part of the Identity Wars story that started in Amazing Spider-Man Annual #38 last month. A preview of this issue can be seen here. 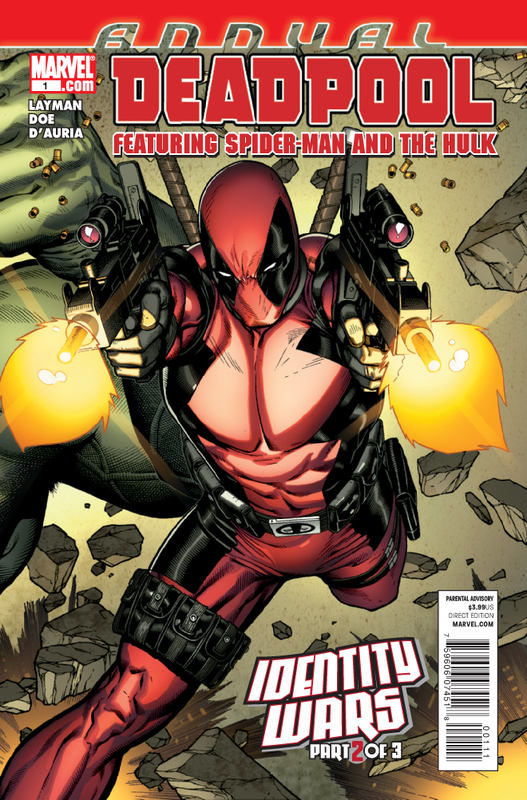 Deadpool teams up with Deadpool (well…Deathwish) in this alternate reality doppelganger extravaganza! The trip to a perfect world continues here from last month’s Spider-Man Annual and features occasional attempts at serious subplot storytelling with guest stars Spider-Man and Hulk. But nothing is as it seems and all will be revealed!